Darwinism and ethics: Does the idea of a blind, undirected cosmos govern our ideas of sexuality? Is there a natural way to live? Here’s how a recent New Yorker article put it, “the loyalty oath of modernity”–isn’t that a grand phrase—the loyalty oath you must take if you want to be considered a modern person—is that “nature is without conscious design … the emergence of Homo sapiens was without meaning or telos” (the Greek word for goal or purpose). The implication is that the human body has no intrinsic purpose that we are morally obligated to respect—and the mind is free to use it any way it wants. That’s exactly how homosexuality is defended by the outspoken lesbian and public intellectual Camille Paglia. By contrast a Christian view of nature is teleological, which comes from that same Greek word telos, meaning goal or purpose. It is evident to observation that living things are structured for a purpose: Eyes are for seeing, ears are for hearing, wings are for flying, fins are for swimming. The development of the entire organism is directed by an in-built genetic plan or blueprint. The reality is that nature exhibits a design, a plan, an order, a purpose—and when we live in harmony with that purpose, we are healthier and happier. In Love Thy Body I tell the story of a woman named Jean who lived as a lesbian for several years, but is now married with 2 children. 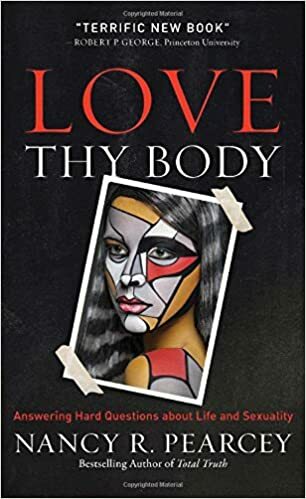 In fact, in Love Thy Body I tell lots of personal stories, and one of my favorites is the story of Sean. As a young man, he identified as gay and was exclusively attracted to other men. Today he is married to a woman and has three children. What changed? What’s interesting is that Sean grew up in a “gay affirming” family and attended a “gay affirming” church, so his change was not driven by any sense of guilt or shame. Instead, Sean says, I stopped defining my identity by my sexual feelings “and started regarding my physical body as who I was.” His goal was not to try to change his feelings, which rarely works. “Rather, it was to acknowledge what I already had (a male body) as a good gift from God.” And eventually “my feelings started to follow suit.” Instead of defying nature, to use Paglia’s words, he accepted his embodied existence as fundamentally good. That’s really the question at the core of this debate: Do we live in a cosmos operating by blind, material causes? Or a cosmos created by a loving Creator which is therefore intrinsically good? I notice that no atheist/materialist (unless challenged) puts any restrictions on this claim. (I’ve heard it many times, in many similar forms.) I suppose they don’t see a need to list any restrictions? Ah, what a difference a worldview makes in the actual world!